A pepper-coriander-chilli based blend that imparts a dark tan and a hot taste to non-veg dishes, especially meat. Since Indians love their meat really spiced up, a fair amount of flavouring spices lend this blend an aromatic chorus. In all meat preparations requiring a dark gravy. Product of India. To cook 500 gms. of meat. Grind to fine paste 2 onions. Mix with 1 tsp Ginger/Garlic paste. Add salt and 4 tbsp strained curd. Marinate cleaned and cut mutton pieces with mixture. Keep for 2 hrs. Heat 4 tbsp oil, fry till crisp 2 sliced onions. 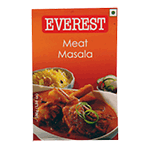 Add marinated mutton, 3 tsp Everest Meat Masala. Stir for 5 mins. Add 2 cups water. Pressure cook for 10 mins.